The Hong Kong bomb squad flick Shock Wave is a nearly nonstop barrage of setpieces. Car chases, wild shootouts, and, of course, explosions abound. Sometimes these elements appear in separate scenes, but often they arrive clumped together. Writer-director Herman Yau, whose career runs the gamut from the grossout horror of Ebola Syndrome to the mainstream martial arts of The Legend Is Born: Ip Man, is clearly a restless soul. This restlessness benefits this film greatly, as Yau is constantly adding new wrinkles to his narrative that make what might initially seem like a pretty rote cop flick into an energetic and delightful treat. Andy Lau (Infernal Affairs) is Cheung, the noble "Number 1" of Hong Kong's busy bomb squad. It takes a special kind of guy to constantly risk his life for the sake of his community, and Cheung never takes the responsibility lightly. In fact, the character is a bit of a self-serious drip. But, he's excellent at his job, and that makes him compelling to watch. The film opens with Cheung undercover with a gang whose leader, Peng Hong (Jiang Wu), has a fondness for pyrotechnics. 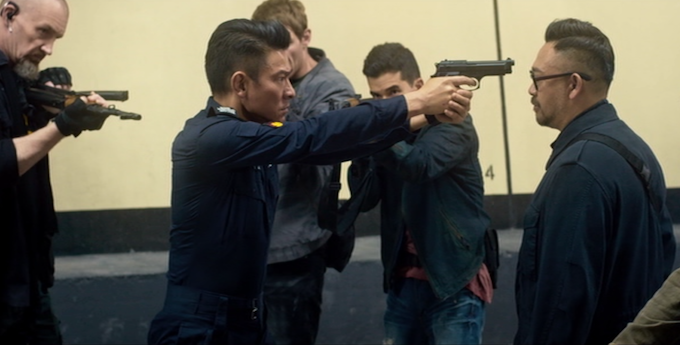 The gang pulls off a massive bank robbery, but when Cheung sees the big boss's brother (Leo Ziyi Wang) start to blow up cars on the escape route, he has to blow his own cover to stop the carnage. Peng Hong gets away in a blaze of confusion, but his brother is arrested. A few years pass. Cheung's esteem with his department grows. He woos a slightly damaged elementary school teacher (Song Jia). Life seems good. Then, there's a sudden uptick in bombings and attempted bombings. Cheung suspects it is Peng Hong, back from hiding and on a revenge rampage. His suspicions are confirmed when the old boss, using the nickname "Blast," leads a crew of gunmen to block off the two-mile Cross-Harbour Tunnel with several hundred hostages inside. He demands a ton of cash and the release of his brother from prison. Of course, even the most meat-and-potatoes cinematic hostage situation never goes exactly as the people on either side would expect, but director Yau allows all of his characters to be smart enough to concoct their own little wrenches to constantly throw into the works of this plot. Even Cheung's girlfriend is self-aware enough to comment fairly early on that it never works out for girlfriends in movies (whether that saves her any trauma or not, I won't spoil). Yau balances frenzied action -- including a downright bugnuts free-for-all of a third act -- with well-calibrated tension and some well-earned emotional beats. In terms of pure entertainment, Shock Wave is -- wait for it -- a blast. For an SD presentation, Cinedigm's widescreen 2.35:1 transfer is extremely strong. Excellent color reproduction, impressive detail reproduction for the most part, and only some sporadic moments of noticeable artifacting. This title is also on Blu-ray, and I bet it looks even better there. We are offered the original Cantonese Dolby 5.1 surround mix and the Mandarin Dolby 5.1 surround dub (with optional English subtitles). Both offer dense and propulsive mixes but, for English speakers, choosing the organic sound of the original language should be a no-brainer. Making of - Bomb Disposal Expert (2:20) - The producers (which includes star Andy Lau) and director talk about the real-life job of bomb disposal. A memorably off-kilter action extravaganza that will satisfy and surprise adrenaline junkies in equal measure. Highly Recommended.